My home village was built on coal. All the local mines had shut before 1984 and open casting was the name of the game. Up until I left home you could see great mountains of slag and earth crouching on the horizon, the engines and buzzers of diggers echoing across the landscape early every morning. There were plenty of current and ex-miners living locally and yet my memory of the time during the Miners’ Strike draws a blank. As I was seven year at the time, there was only the dimmest of dim awarenesses that something called ‘a strike’ was happening with the miners. I can remember it as background noise in the nightly news, and an occasional mention on Spitting Image (when my parents let me watch it – because I thought the puppets were funny). But of the strike in the village, I don’t recall a thing. I can’t remember any collections. There were no coal not dole badges. None of my school mates appeared to be affected. This titanic struggle passed my childhood by. Some feat considering we lived a stone’s throw from south Derbyshire and Nottinghamshire: the crucible of the strike. It is difficult to overstate the impact the Miners’ Strike has had on British political and social history. Everything about politics you know now has been heavily conditioned by the outcome of that battle. Had the strike turned out differently, had the Tory plan to close the pits been seen off there would have been no neoliberalism, no New Labour, no mass privatisations, no unbalanced economy, no race to the bottom. And no more Thatcher. The death of the so-called iron lady would have invited comparisons with Ted Heath, the Tory PM humbled by the miners. You might have had the likes of John Redwood and Norman Tebbit fondly recalling their days in the Downing Street bunker, and of them pouring over the tabled-sized mock ups of how a free market Britain, strangled at birth by the mass pickets of the miners, might have looked like. 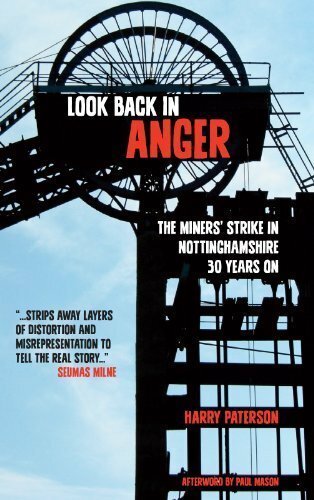 In his excellent book, Look Back In Anger, my friend Harry Paterson calls the Miners’ Strike an “industrial Stalingrad” because of the ferocity of the fight, the resources it sucked in, and the history-defining stakes it raised. There is no more apt an analogy. Harry’s book concentrates on telling the story of the strike in Nottinghamshire where, throughout the year-long struggle, the majority of colliers crossed picket lines and carried on working. This takes in a brief overview of miners’ organisations upto the eve of the strike. Interestingly, what was to happen later had local precedence. ‘Spencerism’, so-named after the Broxtowe Labour MP George Alfred Spencer conspired to and successfully led a Notts breakaway from the Miners’ Federation during the 1926 General Strike. In short, the Area had previous. Yet that does not explain why thousands of miners carried on working while their comrades nearly everywhere else were solid in heeding the strike call. Harry account of the unfolding battle in Nottinghamshire is socialist history writing at its best. The violence meted out by the police, the frame ups, intimidation, the home invasions of striking miners, Harry is as sparing of the police as they were of miners and their supporters 30 years ago. The press and politicians at the time praised the courage of working miners on the Notts coalfield. It’s very easy to be brave when you have the full might of the government at your back. Quite another to stand up to that. Harry captures the solidarity and empowerment of the workers who took this on. Quite rightly the essential work of Women Against Pit Closures is afforded its central place. And the creeping realisation of doom creeps as the strike wears on into the winter, with opportunities for negotiated settlements, solidarity action, and a parallel dispute between the pit deputies’ union NACODS and the Coal Board getting resolved (the presence of a deputy in the pit was a legal requirement for a mine to continue operating). As the book works through the strike, the breakaway of the Notts-based Union of Democratic Mineworkers, the subsequent collapse of the industry, and the disgusting decision of Labour in power to award the UDM a monopoly on handling compensation claims arising from Vibration White Finger, Harry takes the scalpel to a few myths. First, ‘there should have been a national ballot’. The book explains the NUM was not a unitary organisation but a federation in which each of its Areas had a large degree of autonomy. Each of the Areas came out after South Yorkshire according to local ballots that were fully constitutional. The dispute was latter ratified as national by a special delegates conference of the NUM’s areas, and the motion for a national ballot was voted down. Not that a ballot ratifying strike action would have made a difference to the Nottinghamshire majority anyway. Nevertheless, what this clearly shows – and Harry is able to document throughout – is how a ballot was not in the gift of Arthur Scargill to grant. The 30 years of calumny shovelled his way is exactly that. While, of course, the leadership handled negotiations, the strike was very much run, driven and led by the rank-and-file. To make it a matter of NUM leadership, as Tories and Trots in their own way did at the time and have continued to do so since betrays a basic ignorance of the struggle. Ultimately, while the miners could have won the strike had the TUC delivered secondary action promised, had NACODS rejected a deal, had – perhaps – the leadership produced a slightly different negotiating strategy. But it was the Nottinghamshire majority, the scabs, Margaret’s men, the blacklegs who could not see beyond the end of their nose that killed the strike. Notts, as the most productive and modern of Britain’s pits, saved the government’s bacon. Without Thatcher’s fifth column in the enemy camp breaking the miners and with it, Britain’s labour movement, the government’s task would have been far harder, if not impossible. That is where responsibility for the failure of the Miners’ Strike, the smashing of an industry, the destruction of hundreds of communities, lies. These people are responsible for the dog-eat-dog society we have now. Not with NUM. And certainly not Scargill. They betrayed out future. For a relatively short volume, Harry has produced the definitive overview. In his hands, the period, the class struggle comes alive. In short, if you’re in the labour movement, new to politics, new to socialism, Look Back In Anger is indispensable. Posted in: Books, Labour, Politics, Trade Unions. Well, I am neither a Tory nor a Trot and I remember the strike, was active in support and have read a fair bit about the strike and still I think that the NUM leadership was disastrously poor. I am fairly used to abuse for uttering what for some is clearly a heretical thought but I hold it as a result of my knowledge and analysis of the strike. In left-wing and trade union circles at the time there was a high level of intimidation and it was far from easy to question where the NUM was taking the miners. It became increasingly clear to some of us that it was taking them to complete defeat and doing immense harm to the hold trade union and labour movement in the process. A movement of that importance cannot be driven by rhetoric and hype (I still have copies of the The Miner which are full of it) but by careful analysis an sober calculation. The NUM leadership failed on that and many other counts. Many find it unpalatable to hear that but it would be a start if they could accept that it is an opinion that can be honestly held by people on the left who have given the matter some thought. One of the many big mistakes of the NUM was to believe that mines where the majority had not chosen to go on strike could be “picketed out” against their will. Then there was the nonsense about there being no such thing as the “economic exhaustion” of a pit. One could go on, the list is long. It’s a comforting dream but it is only a dream. The miner’s strike could not have succeeded precisely because the NUM objectives were too wide, its arguments were often poor, its tactics ill-considered, its unwillingness to listen to those it wanted support from and its unwillingness to compromise. Even if the miners’ had won the long-term changes to energy generation would have continued. The wind-down of the coal fields would have been less brutal and no doubt would not have gone so far. But there is no reason to believe that it would have heralded a new socialist dawn. I’ll read Harry Paterson’s book but on the basis of this account I wonder what it will add to the political analysis. Before the backlash David, Well put. ‘Don’t get mad, get even’ is perhaps a better policy. A miners lot was never really a happy one, digging away at coal seams thousands of feet under ground in wretched hot dusty conditions; yes it provided jobs, but you tended to die young through respiratory problems or mining accidents. Poor leadership was the cause of the collapse of the Industry. Given that the author was only seven years old at the time it’s a bit rich to refer to miners as “scabs” and “blacklegs”. How long will this go on for when children inherit the hatred of their predecessors ? My old mine was one mile down but it was actually better doing that then working in Tesco or Asda . If they are the words of someone older that was directly involved in the situation at first hand , that’s a differen matter, they were there as an adult and have every right to use the terms that fit. What I object to is those that were too young to know what really happenned, or weren’t even there, taking on the mantle of their parents anger without question. And I’m someone that is old enough and did support the miners at the time but I now wonder if too many people jumped on the bandwaggon and encouraged the miners to hold out for too long, once it was obvious that the state would never back down. My apologies, Poundin. My mistake. I thought the remark referred to the author of the book – me, aged 17 at the start of the strike – rather than the author of the article – Phil, aged 7 during the strike. I wondered if you were the author. I’ve read some very good reviews of your book and I look forward to reading it as I hear it’s an excellent social commentary, well written and researched, rather what I feared which was – oh no – another political tract. All the best in your next project. You’re very kind. Thank you. I’m delighted with it’s reception, thus far, it’s fair to say. It’s trenchantly partisan but I broke my neck with the research and fact-checking. Readers might disagree with my conclusions but will be unable to attack the facts. The Thatcher Government lied to the Country of its overall aims. It lied about pit closures and lies continue over NUM leadership. The Nottinghamshire coalfields had a notorious history of going against the common thread of the union and ultimately, their leadership was dismissed by Thatcher and their pits closed too. Maybe Arthur should have just had a chat with the Thatcher Government and everything would have turned out just fine. I look forward to the Orgreave trials and look forward to proof of doctored police evidence and doctored TV footage. Are you suggesting that the NUM leadership sent miners to kill a miner? If so, state this case as I and everyone else wants to hear it. I know the story you refer to very well, but not the assumption of murder. On the other hand, I’ve already seen potent evidence which should see police offers go to prison. I believe that this Country’s leading QCs have finished their evidence gathering and have come to their own conclusions. So what you’re saying is that a man on strike caused the death of another man and the NUM leadership had nothing to do with it. You should have said that from the start. My apologies for thinking you meant that the death was orchestrated by the NUM and the leadership. Personally, I think it a wonderful act that the Union paid out compensation to someone who died on their watch. It was a class war where bosses pitched workers against workers and as usual, the bosses won and the Conservatives won. If we had kept all miners at home on full pay plus bonuses drawing no coal whatsoever, but paying the same subsidy as the nuclear industry gets, British coal would have made a huge profit. This studies and reports how the varous institutions (Labour Party , trade unions , councils, magistrates, charities, social services etc) responded during the strike to the pligght of the miners and their families. The reported political bias of the local social services makes for disturbing reading as tribunal judgements invariably went against any miner and his family and has never to my knowledge really been reported or addressed. Thanks for the reference. I have downloaded the thesis and glanced through it. It looks interesting. I notice that it looks at not only how patchy action for the strike was in the labour movement generally but also among mining communities as well. The author seems to want to bust a lot of the myths surrounding the strike and that is certainly something for which there is still a real need. I will take the time to read it carefully. I found the political bias and pressure placed on DHSS tribunals quite remarkable. Some very strong allegations are made and the author is very credible given how thoroughly researched and referenced the material is. I was also moved by the actions of a local councillor who used his own money to buy children’s shoes after months of wrangling with the DHSS over payments. The report gave me a strong sense of how many couragous and principled voluteer activists there were at the time who invested everything they could to improve the plight of ordinary people caught up in the mayhem. I have now read most of Look Back in Anger. It is not without interest in that it gives more detail from the miner’s strike as seen from Nottinghamshire that has been available elsewhere. Unfortunately, the author’s presentation of events is highly tendentious and his presentation of the ‘facts’ is so selective that I did not feel that the book contributes in any significant way to the understanding how such a mighty struggle could end in complete failure. There is no consideration of the ill-thought through objectives (e.g. no economic factors in the calculation of exhaustion) and the misconceived strategy and tactics (trying to picket miners out when they had had no chance to reach their own decision). It really is time 30 years after the strike to stop trying to prove who was or wasn’t a traitor to the working class and to examine carefully how such an important union could manage to alienate its natural allies and how its concept of victory was so rigid that it could not be achieved. The book repeats over and over again “the ultimate working class commandment: thou shalt not cross a picket line”. This was also the overriding argument used in the strike itself. But, despite its simplicity and superficial attractiveness it is nonsense. It should be clear to anyone who reads working class history that strikes can be and have been called for reasons which are wholly unsupportable by socialists (e.g. for sexist and racist reasons). Beyond that there have been strikes where crossing the picket line is a planned tactic (half the factory in and half out alternately). Finally, the whole point of a picket line should be to remind people in a given workplace of the decision that their workplace colleagues have taken and which they are undermining by continuing to work. It should not be to force people out who have not yet taken that decision in their workplace. The NUM took this so far that it advised other unions that power stations should be deemed to be picketed even if no pickets were present. On this basis of such a combination of flying pickets and virtual pickets a small group of people could undemocratically determine the action of vast numbers. We need a sensible discussion about such things and I am afraid that this book does not provide it. Neither does it reflect helpfully on the question of the use of violence and physical intimidation use for a union cause. It is one thing to report on the violence and intimidation of the police and other state agencies and I have no doubt about that for a moment. But that does not remove the need to think about the inappropriateness of these tactics for the cause of trade unionism and socialism. Other trade union leaders who wanted to support the strike were repelled by Scargill’s intransigenc. The NUM wanted total support from the other unions without any obligation on its part to listen to their doubts and criticiss about some of the things they were being asked to support. There is still too much position taking on the miners’ strike (‘were you on the side of the working class or not?’) and too little careful reflection (how could such commitment and initial widespread support result in total defeat?). Just clinging to “working class commandments” and blaming the evil of ‘class traitors’ for the defeat is far to close for comfort to the sort of reasoning that one gets from religious fundamentalists.